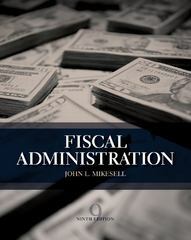 Fiscal Administration 9 Edition Ever wonder how federal finance really works? FISCAL ADMINISTRATION, Ninth Edition, shows you how public budgets operate and gives you the opportunity to crunch the numbers. With actual data from the U.S. federal budget, including its breakdown, you can see for yourself how policymakers allocate money. Each chapter illustrates concepts and issues with case studies from the private sector as well as from public finance. Available with InfoTrac Student Collections http://gocengage.com/infotrac.